Homefront has sold more than a million copies and passed the "key break-even level" into profitability, turning the critically-maligned game into a success story for THQ. 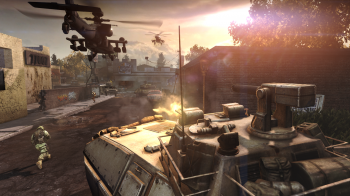 From a critical point of view, THQ's Homefront didn't live up to expectations. Based on a near-future Korean invasion of an economically-collapsed United States, the game was met with lukewarm reviews when it came out earlier this month and currently sits at a not-too-hot 70 score at Metacritic. It looked like bad news for THQ, which bet heavily on the game giving it a little bit of presence in the military shooter genre, but it turns out that things might not be so bleak after all. THQ announced yesterday that 2.4 million copies of the game have shipped thus far, with estimated sales of over one million units worldwide. That's nowhere near the monster numbers of the Call of Duty franchise or even EA's Medal of Honor reboot, but it's enough to give THQ a foot in the door and, even more importantly, to bring in a little cash. The strong sales led analyst Colin Sebastian of Lazard Capital Markets to increase his estimates for THQ's fourth quarter, saying the game is now past the "key break-even level" and that the 2.4 million units shipped is actually higher than expected. Doug Creutz of Cowen and Company, meanwhile, believes Homefront will break the two million mark and allow THQ to hit its full year financial estimates for 2011 and 2012. "We are very pleased with strong worldwide shipments and sell-through for Homefront and we continue to fulfill new retail orders for the game across the globe," said THQ President and CEO Brian Farrell. "Homefront is clearly resonating with gamers and we are certainly pleased with our initial sales results."